I have helped families at the end of a family member’s life through hospice team work in homes, assisted living situations, and nursing residences. I am a founding member of the National Home Funeral Alliance, and have completed a year of funeral services courses at Lake Washington Institute of Technology. I have created and ministered for everything from large memorial services to intimate home memorials. 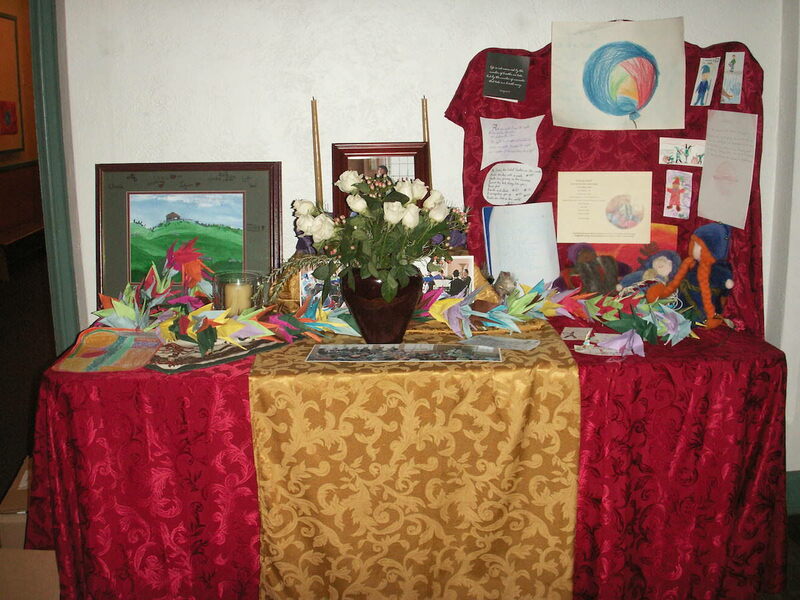 The photo is of a memorial table in the lobby of a church for a private school teacher at her memorial service. Memorial services can be as varied and creative as any celebration for a loved one. Because each of us has a different relationship with death and different ways of working through loss, great care and understanding is important when meeting with family members to design just what is needed to celebrate the life of a loved one who has died. The circumstances of the passing does affect the mood of a service. With warmth and sensitivity we may create together just what is needed. We can invite guests to a beach for a celebration. A home or church may also serve as a place to honor a loved one. Tree planting is one way to provide a living memorial. Really, there are unlimited ways to celebrate the life of your love one.